Provinces and subprovinces of the Colorado River drainage area, as recognized in this report, are based on physiographic character, on rock structure, and on the age of surface rocks. The value derived from using such subdivisions is chiefly that of ease in making descriptions of geologic features. Thus, elements of similar nature are considered together and contrasts are made apparent. This portion of the report is prepared with a twofold objective: first, to present a general description of geology in the Colorado River drainage system and, second, to indicate specific features of unusual interest or unique character which should be permanently preserved and or made accessible because of their educational or inspirational values. The general description of the area is essential to an understanding of the individual features which are discussed in more detail later. An appreciation of these features is essential in evaluating the recreational possibilities of the region or in planning its development. In its continental relations, the area comprising the drainage basin of the Colorado is a feature of the great intermountain region outlined by the Rocky Mountains and the Sierra Nevadaan enormous expanse of relatively low land that might have been drained by a single river system. During Tertiary times this vast area was separated into two parts by the building of crinkled mountains in western Wyoming and uplifting masses of sedimentary rock to form the high plateaus of Utah. West of this common boundary is the Great Interior Basin, characterized by elaborately faulted and uptilted strata arranged as ridges between broad flatsa region of dwindling streams which never reach the sea. East of the division zone and extending to the crest of the Rocky Mountains lies the well-drained Colorado Basin, developed in dominantly flat-lying sedimentary rocks whose continuity has been interrupted by lava flows and igneous intrusions, and which in places have been bent upward into monoclinal folds or sliced into long earth blocks by faults. During a large part of Tertiary time the basin was the dumping ground for rock debris worn from its border lands. As a regional structural unit the Colorado drainage basin is a geosynclinea downwarp formed at the time when its counterpart, the Rocky Mountains, was upraised. An outstanding feature of the Colorado River Basin is the alinement and the peculiar local setting of the drainage channels. The original streams chose courses in accord with regional and local slopes and the relative hardness of the surface rocks. Some doubtless were through-flowing and others formed lakes, but nearly all of them eventually became parts of an integrated drainage system whose master stream, the Colorado, reached the sea. In the soft, uniformly textured Tertiary rocks that once covered most of the plateau country, the streams developed in the usual fashion, but as their channels were deepened, more resistant rocks in various attitudes were encountered. To escape these obstacles, some streams developed new round about courses, but many were so firmly established in deep trenches that readjustment was impossible, and as erosion of the adjacent lands proceeded their position became glaringly out of accord with the topography. Thus, with seeming disregard of regional features, the Green River crosses the Uinta Mountains, the Uinta Basin, and the Tavaputs Plateaus, and its tributaries pass through, instead of around, rock domes; the San Juan River meanders through Hogback Mountain and the Monument upwarp; the Paria River crosses the East Kaibab monocline; the Virgin River plunges through the Hurricane Cliffs, and farther on through the Beaverdam and Virgin Mountains; and the Colorado itself flows squarely across the Grand Hogback and the Waterpocket Fold and has cut a mile-deep trench across the Kaibab Plateau. Obviously, these streams, so strangely out of place in the present landscape, are superposed; they have inherited courses established on higher, less complex surfaces. They illustrate the superposed stream pattern characteristic of the entire Colorado drainage basin. In developing their runways by down cutting, headward cutting, and the sluicing-out of rock waste, the Colorado and its scores of tributaries have removed from their drainage basin rocks with an average thickness of about 5,000 feet, and during this process have exposed all the major geologic formations. Along the Grand Canyon, where vigorous erosion has continued longest, rocks of Pre-Cambrian and Paleozoic age lie at the surface; northward across Utah, Mesozoic rocks predominate; and in southwestern Wyoming the floor of Tertiary limestones and shales is almost continuous. In southern and western Arizona, below the great plateau region, the Colorado River and its tributaries drain an area totally different from that to the north. Rugged mountain ranges rise above broad, flat valleys like islands in the sea. The mountains contain rocks of many geologic ages and their structural histories are complex. Surrounding plains are in reality deep valleys that have been filled to thousands of feet with debris worn off the mountains within relatively recent geologic time. The present drainage follows the gentle surfaces of these valley floors between the ranges, flowing over sediments at low elevations. The general floor of this regional basin consists of flat stretches and broad slopes of gentle gradient trenched by relatively broad valleys and shallow canyons, but is roughened by ridges and elongated domes sufficiently high and resistant to erosion to outline somewhat poorly defined subordinate units. The Rock Springs Dome and the White Mountains separate the Great Divide Basin4,200 square miles in extentfrom the Bridger Basin, the latter extending along both sides of the Green River, from the foothills of the Wind River and Gros Ventre Mountains southward for 150 miles to the base of the Uinta Mountains. The lofty cuestalike Lany Rim and Cathedral Bluffs mark the boundary between the Bridger and Great Divide Basins and the Washakie Basin, and farther south the anticlinal Cherokee Ridge separates this structural depression from the much larger Yampa Basin. Though its average altitude exceeds 6,500 feet, the Green River Basin is surrounded by mountains 10,000 to 12,000 feet high. At its northeastern border stands the massive Wind River Range. On its southwest side, the broadly exposed granite core of the range rises abruptly from the flat lands of Bridger Basin along a fault, and northeastward is flanked by the truncated edges of steeply inclined strata. The Wind River Range originated as an uplift in late Cretaceous time, during which thick, horizontal Paleozoic and Mesozoic strata were bent upward in elongated anticline. Then during a long period of erosion the up-arched strata were worn down to Pre-Cambrian rocks and the mass uplifted again and reexposed to erosion by the present-day powerful streams. The southeastern border of the Green River Basin is defined by the Park Range, which essentially is a mass of ancient granite; the basal rock of an anticlinal uplift that in Pre-Tertiary time was deeply mantled with sedimentary rocks. In consequence of erosion, a second uplift, and recent dissection by streams, the originally arched surface of the range has been worn down to a plateau of moderate relief, above which in places rise craggy, glaciated alpine ridges to heights exceeding 12,000 feet. The eastern border of the Green River Basin between the Park Range and the Wind River Mountains is poorly defined. For a distance of 125 miles the rocks characteristic of the crests of the high ranges along the Continental Divide occupy a huge structural sag, where they are covered by sediments of younger age. In the place of the usual topographic drainage divide, the margin of the basin is a sinuous line across featureless plains where the intermittent and ephemeral streams tributary to the Green River seem to be interlaced with those flowing eastward to join the Platte. The drainage pattern of the Green River Basin is peculiar; to an extent not duplicated elsewhere in the United States, the alinement of rivers and creeks is out of accord with the topography. Bitter Creek goes through, instead of around, the Rock Springs Dome, crosses a valley, and then plunges directly into the face of White Mountain. In the present topography an unobstructed course lies 1,000 feet below. Equally remarkable is the drainage of the Great Divide Basin, particularly the Red Desert, where the streams have no outlet. On a surface of flat land, ridges, and remnant mountains they terminate in alkaline lakes or die out on mud flats in the midst of brightly colored sand dunesthe all-year home of antelope and a winter grazing ground for sheep. The interpretation of the anomalous stream pattern its wholesale disregard of present day mountainsinvolves the assumption that the Pre-Tertiary rough floor of the Green River Basinits highlands and lowlands alike was completely buried by younger sediments and that the courses of streams established on the new-made surface have been maintained regardless of the structure and composition of the exhumed mountains encountered in down cutting. In geologic terms, the entire drainage system is superposed. Within the Green River Basin most of the exposed rocks are sedimentary in origin and geologically very young. Lavas cap a few mesas and, at Leucite Hills, lavas, volcanic tuffs, and ash occupy about 750 square miles; in a few places Upper (?) Jurassic rocks are in sight; and Upper Cretaceous beds crop out in some valleys and inter-stream areas and are uptilted along folds and faults. But the basin is almost completely filled with Tertiary strata in nearly horizontal position. (Pl. 13, Secs. 1 and 2, in pocket.) The hard Cretaceous rocks form hogback ridges, while the poorly consolidated Tertiary strata erode into banded cliffs and picturesque castles, towers, "pulpits," and "witch rocks," in places into extensive badlands. From them have been obtained the fossil mammals, fish, birds, and plants exhibited in American and foreign museums. Yampa River Valley.The salient Yampa River Valley topographic and geologic features of the Green River Basin in Wyoming extend southward into northwestern Colorado where an area of about 2,000 square miles drained by the Yampa River, particularly its chief tributary, the Little Snake River, is surfaced with rocks of Tertiary age. This plainlike expanse, most of it north of the Yampa, is trenched by shallow streams, and its easily eroded soft rocks have been carved into attractive small-scale badland forms. Locally, the Tertiary beds are overlain by lavas or so far stripped away as to expose Cretaceous sandstones, igneous dikes, and volcanic necks. At the Elkhead Mountains, a lone mass of metamorphic and igneous rock that culminates in Hahns Peak (altitude 10,824 feet) interrupts the continuity of the flat-lying Tertiary beds. Near its mouth the Yampa has cut deeply into the steeply tilted rocks of the eastern Uinta Mountains, exposing the edges of Paleozoic and Mesozoic strata. The Yampa also transects Cross Mountain and, farther east, Juniper Mountain, which are short domelike masses that rise abruptly from the regionally flat surface. Like Douglas Mountain and Spring Mountain north of the river, these conspicuous landmarks are anticlines once arched over by Cretaceous rock but now so deeply eroded that the Cambrian and Pre-Cambrian core rock is exposed, and against it the Paleozoic and Mesozoic formations lie in orderly sequence. In shape and structure these isolated masses are so like the Uinta Mountains that they have been dubbed "Little Uintas." Also suggestive of the Uinta structures is the remarkable Axial Basin a valley formed by stripping away the crest of an anticline which crosses the Yampa River and farther southeast merges with folds of the White River Plateau. The sequence of strata shows that the anticline is post-Eocene in age; the date of the second up-arching of the Uintas. South of Juniper Mountain, beyond the Axial Basin, the land rises to the anticlinal Danforth Hills, which stand 2,000 feet above the bordering lowland and outline the drainage divide between the Yampa and White Rivers. Here in the Cretaceous rocks, Goodsprings, Wilson, and Morgan Creeks, and Maudlin and Temple Gulches have cut deep channels across hogback, ridges, and the Collom syncline. From Juniper Mountain to Steamboat Springs, Colo., except near the mouth of Elkhead Creek, where Tertiary rocks are exposed, the Yampa and its southern tributary flow on Cretaceous rocks, developing broad valleys and rounded hills in soft shales, and rugged landscapes of ridges, mesas, and "pagodas" in the most resistant sandstone. The many-branched Williams Creek, Trout Creek, and the Upper Yampa start abruptly at the Flat Tops extensive sheets of basalt and andesite. East of the latitude of Steamboat Springs, characteristic landscapes of the Yampa Basin entirely disappear. In the topography the plainlike surfaces developed on approximately horizontal beds are replaced by rugged mountains trenched by steeply inclined streamways and, as stratigraphic units, the dominant Tertiary formations are replaced by schists, gneisses, and granites. In other words, the southeastern edge of the Green River Basinthe northeastern edge of the Colorado River drainage basin lies on the west slope of the Park Range and its features are those of the Rocky Mountains rather than of the plateau lands farther southwest. 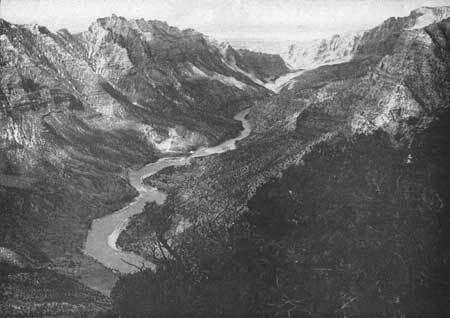 Figure 19.The Green River passed through Split Mountain, part of the Uinta upwarp. The rocks of the Uintas contain a rich fossil fauna. The bones of dinosaurs are particularly abundant in the Jurassic Morrison formation at Dinosaur National Monument. The major events in the geologic history of the Uintas include two periods of crustal movements, two of widespread denudation, and an epoch of glaciation. Soon after the close of the Cretaceous period the rocks of the region were pushed upward in the form of an elongated fold, thus bringing strata previously below sea level to altitudes exceeding 20,000 feet (Powell's estimate is 30,000 feet). This great up-arching was associated with down-warps paralleling its borderson the north the Bridger Basin, on the south the Uinta Basin, and on the east the Yampa Basin. Then followed a period of erosion, an estimated 45,000,000 years, during which the range was greatly reduced in height. The bordering strata were truncated, and rock thousands of feet in thickness eroded from the highlands, the sediments being deposited in the adjacent basins, forming thick extensive deposits of sands and muds, now represented by the formations of early and middle Tertiary age. Before denudation ceased, the original lofty mountains had been worn down to a low-lying surface, probably of inconsiderable relief. In late Tertiary time, crustal upthrust was renewed, the remnant of the original arch was raised, and the edges of the flat-lying surrounding sediments were bent upward. There was thus introduced a second major cycle of erosion which has not yet come to an end. The new conditions have been favorable for roughening the surface of the mountain mass by cutting deep canyons and outlining peaks and ridges, especially along the borders. Twice during the glacial period the summit mountain surfaces were covered by ice. Thirty distinct glaciers, the smallest 1-1/2 miles long and the largest 27-1/2 miles long, extended down the highland valleys. Over an area exceeding 1,000 square miles only a few peaks and narrow divides escaped burial. The peculiar work done by these stationary ice caps and slowly moving ice streams is plainly recorded by striated rocks, cirques, U-shaped valleys, moraines, and glacial lakesabout 400 of them large enough to be shown on maps. Most of the streams in the Uinta region are in accord with the topography, and also generally with the structure. They occupy synclinal troughs or descend the flanks of anticlines, and locally follow courses determined by the relative hardness and attitude of the rocks encountered. In other words, they are consequent or subsequent streams. A conspicuous exception to the normal arrangement is the Green which, after flowing southward for 150 miles over soft flat-lying rocks, abruptly turns east, crosses a great fault, meanders through the hard, steeply upturned rocks along the flanks of the Uintas, and passes entirely through the range in spectacular canyons. To account for this abnormal course involves the supposition, based on a study of the regional geology, that the ancestral Green River was established on a surface that lay far above its present canyon walls at a time when the eastern end of the Uintas was buried beneath strata of late Tertiary age. In consequence of readjusted alinement caused by the growth of its tributaries and by local tilting and faulting, the stream became so well established that it maintained its course, cutting through the soft rocks and on into the complex hard rocks its present floor. Like many rivers in surrounding regions, the Green through the Uintas is superposed; its course has been inherited. The Uinta Basin is both a topographic and structural depression. In generalized north-south profile across its central part, the surface descends from 7,000 feet at the base of the Uintas to about 5,000 feet (along Green River, 4,000 feet), then ascends to altitudes of 8,000 to 9,000 feet. This topographic expression is largely in accord with the attitude of the underlying sedimentary rocks. In structure the basin is a long syncline; from its axis northward, the strata bend upward to the base of the Uintas and southward up the back slopes of the Tavaputs Plateaus. The Uinta Basin is a profitable agricultural section, a potential oil field, and the site of the largest and oldest Indian reservation in Utah. It is a famous source of fossils, and derives additional geologic interest from its scattered outcrop of solid hydrocarbons, which include rare types, some of them unique and little understooduintaite, native asphalt, ozocerite (mineral wax), wurtzililze, tabbyite, and bituminous sandstone. Especially peculiar are the deposits of commercially valuable gilsonite, which on both sides of the Green River fill deep vertical cracks 1 to 8 feet wide and 3 to 8 miles long, and appear at the surfaces as conspicuous black streaks.